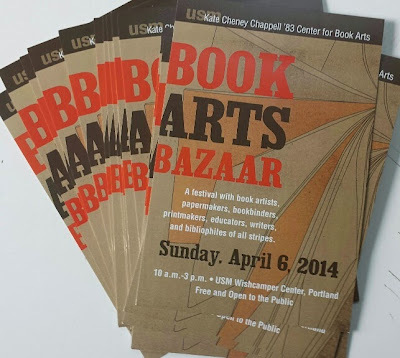 I'll be at the Book Arts Bazaar—A festival with book artists, papermakers, bookbinders, printmakers, educators, writers, and bibliophiles of all stripes—on Sunday, April 5 at the University of Southern Maine Wishcamper Center in Portland, Maine. It's free and open to the public. Should be a great day! Should be great fun. I'll do a post about it after Lisa.